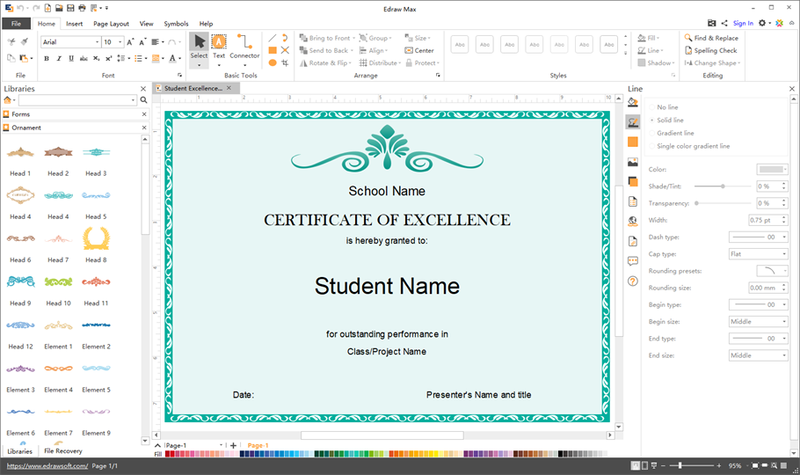 Certificate maker assists you to draw personalized certificates with minimal efforts which will save you time and increase your productivity. Start with built-in elements and design up to your own creativity and requirements. 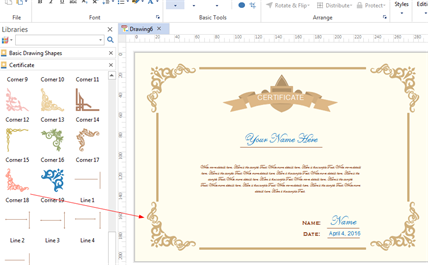 The Certificate Maker provides you with an incredibly simple interface that requires little efforts to get used to, no matter what level of users you are. It not only gives you plenty of certificate elements that you can directly use, but also offers tools to draw custom elements on your own. The program includes a large variety of certificate elements covering certificate heads, certificate borders, corner elements, lines, etc. User can create new certificates by composing these existing elements or draw new elements that fit your special requirements. The software contains powerful customizing tools to make sure every detail out of your mind can be properly visualized. You can easily customize the colors and lines of shapes, change background, apply gradient color, insert local images, set page size, draw new elements, and export the certificate to a great variety of formats. To start quickly, a shortcut is using ready-made certificate templates. 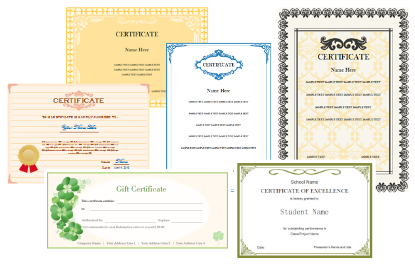 Our certificate maker includes a group of good-looking certificate templates that you can choose from. 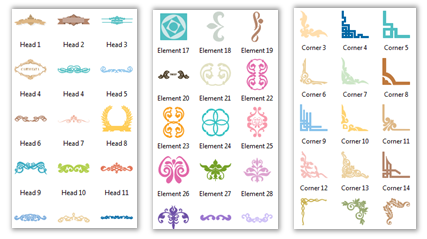 Simply open a template, replace with your own text, and customize the looking according to what style you like. Besides certificates, there are also templates for infographics, flyer, poater, presentation, brochure, banner, card and flowchart, etc. Fantastic Certificate Maker Everyone Would Love and Enjoy! 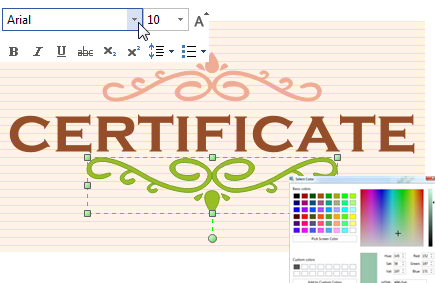 A fun, quick, and easy to use certificate maker for you to make personalized certificates with pre-made certificate elements and lots of powerful tools. You will definetely love its simplicity and the super flexible drawing features. Try it now!